Novotel Bangkok Platinum Pratunam is a hotel in Bangkok. Its location is above The Platinum Fashion Mall. The hotel is right in the middle of Bangkok’s fashion and shopping district. The hotel connects you to the main tourist attractions in the area with Bangkok’s Skywalk. It is just a minute walk to Central World Shopping Centre, Siam Paragon, Siam Centre, Siam Square, MBK. Likewise, Neon Market and Pratunam Market are also just steps away. For public transport, Siam and Chidlom BTS Skytrain Stations are just minutes walk from the hotel. This Bangkok Hotel blends comfort and technology. It is the perfect choice for your next stay. Whether you are on business trip or on holiday, this hotel can fully welcome you. Besides, the hotel is ideal for a shopping trip with friends or a short vacation with family. All in all, there is no other Bangkok hotel that suits you like Novotel Bangkok Platinum. With 288 well-designed rooms, the hotel provides you with modern room amenities. Each room comes with a private bathroom. It is equipped with hot-water showers and a hairdryer. To keep you connected, all rooms provide free Wi-Fi internet. On top of that, each room has a flat-screen TV, minibar, coffee and tea facilities for your leisure. Plus, all 288 rooms offer electric safety box and smoke alarm in room for safety. 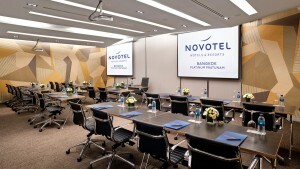 Novotel Bangkok Platinum offers two bars and two restaurants. Yet, the hotel has five multiuse meeting rooms. The hotel’s business centre offers a wide range of professional services. Further, kid’s club with a play area is available for families. Also, Wi-Fi is free for the whole hotel. Plus, an infinity swimming pool and fitness centre are free for in-house guests. On top of that, the hotel also has a free indoor car parking space. Stay in one of the best Bangkok hotels. So, let us help you create a great trip. Let the fun begin by taking a tour around the Ratchaprasong-Pratunam. You can do so with our free Tuk Tuk service. It is a common Thai way to commute. Our Tuk Tuk will take you to anywhere around Ratchaprasong and Pratunam areas. Try amazing food at The Square. It is a trendy and relaxing dining place located on the 6th floor. The restaurant offers the best International seafood dinner buffet in Bangkok. Also, the hotel has Platinum Restaurant & Lounge. This modern Thai restaurant offers fusion Thai food with the best city views. You can also enjoy live Thai Classical music here every evening. You can sip great cocktails while watching Bangkok’s skyline at View Rooftop Bar Bangkok. It is the most unique rooftop bar in Bangkok. This rooftop bar is the best spot to see Bangkok move beneath you. You can watch the sunset until the stars shine at night with the best city views here. These are the only Bangkok hotel like us can offer. And do not forget to chill at our pool with a glass of cocktail. It is the greatest way to complete your last day of vacation before flying home. This hotel is the best choice among Bangkok hotels. It offers you many choices of dining options that answer to all your needs.